Almost everything we sell is made or assembled in the USA. Below we explain the various methods of craftsmanship that go into each piece of furniture. We take pride in who we are and hope this information will make your decision to buy at Bassett a little easier. BenchMade is handcrafted by skilled artisans in the USA from trees harvested in the Appalachians. Each piece is meticulously detailed and finished by hand. One at a time, the old fashioned way, in Bassett, Virginia. 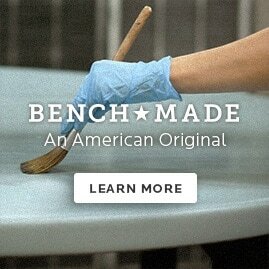 Most of our upholstery is hand assembled and sewn with pride in North Carolina and Texas. That includes routing and assembling the frame, cutting and sewing the fabrics and leathers, and upholstering the finished product. There are lots of people involved and every one of them takes pride in their work. Because of our commitment to custom furniture without the customary wait, we don’t make it until you order it. For some wood products, we stock components that we source globally. We inspect, assemble and finish it just for you. With Bassett, you get custom furniture without the customary wait. To bring you a collection of beautiful fabrics and leathers, we search the world for the finest available from weavers and tanners who take pride in their quality and reputation. Sometimes we find just the right fabric or leather right here in the US. Or it could come from Europe, South America, or Asia. In order to bring you the detail and style you want, we source some of our designs from furniture makers around the world. We have partnered with people we trust, who understand our desire for exceptional quality, and make a commitment to a clean healthy workplace. We inspect factories several times a year to make sure they live up to our standards.